Not sure whether to bring flowers or wine? Bring both in one bottle when you bring Muscat. Wines made from this grape – and there are many, as it grows everywhere – are immediately recognizable by there pretty floral scent, paler and more delicate than Gewurztraminer’s without the spice. Muscat at a glance: pale color; light, sweet, green grapey fruit; light, flowery fragrance, often like orange blossoms; low acidity. For drinking soon after its vintage date. Most Muscat grown around the world is made into sweet wines, but there are some very fine dry versions from the Alsace region of France. Italy makes many Muscat wines, some of the best of which are the lightly sweet and sparkling Moscato d’ Asti of Piedmont. In southern France, southern Italy and Australia a delicious, sweet dessert wine is made with the addition of alcohol. Oh, by the way Muscat is also called Moscato, or Moscatel. Our tasting was done in 3 sections. The first had 4 wines going from dry, off-dry, to semi sweet and sweet. 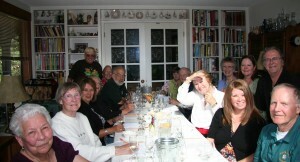 The second set was 4 sparking wines with low alcohol from Oregon, Spain, Italy and Washington. The third set was 2 sweeter dessert wines with higher alcohol. One bonus wine was added from Washington which actually came in 2nd place in the groups scoring.